I'm sure everyone has heard horror stories about having terrible in laws.. Well, I'm very blessed because mine are awesome. As you may have noticed, my sister in law Chaikka and her boyfriend Don, appear a lot in my blog because we love spending time with them. And ever since she and my dad in law moved into our village, we make it a point that Rain visits him as much as she can. Rina's dad is really cool, and has the most infectious laugh. We get along great because he's really easy to talk to and you feel you can tell him anything. 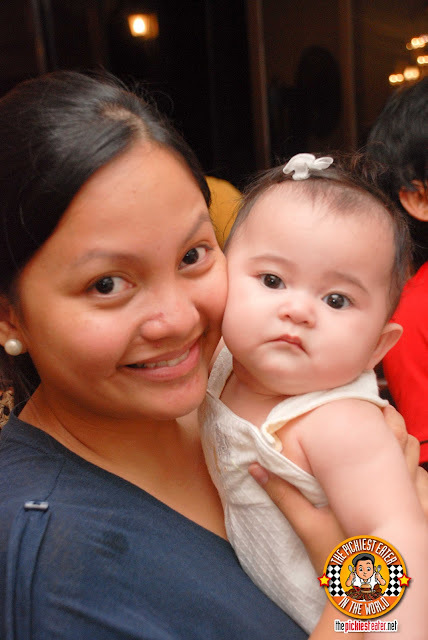 The very second Rina's dad found out the doctor gave Baby Rain the Go Signal to take Rain on out of town trips, he immediately scheduled a day for him to take all of us to Tagaytay. He wasn't going to miss the chance to be the one to take Rain on her first out of town excursion! Basically, "Daddy Cool" as he wants Baby Rain to call him when she grows up (I told you he was pretty awesome), just wanted something simple.. Find a place to hang and enjoy the view of Taal Volcano, and afterwards, have a great meal. Naturally all of them looked at me for the best place to eat, so I had to do a little research, with Tagaytay being an unfamiliar area to me. I asked Rina's dad if he had a certain cuisine in mind, and he said, "Anywhere... just as long as there's Bulalo!". 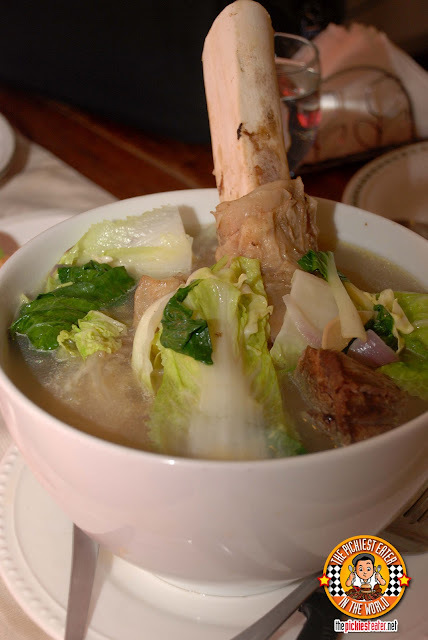 Bulalo. Of course. A Tagaytay staple. So I was thinking, when you're in Tagaytay, and you're looking for a unique dining experience with your family, where should you go? "Pamana" became the obvious answer. As spectacular as the view of the Taal is, there's actually not really much to do in Tagaytay but eat and stare at the Volcano. I heard about Cliffhouse having a fantastic view of the lake (as well as a branch of Mochiko), so we hung out there for a bit. 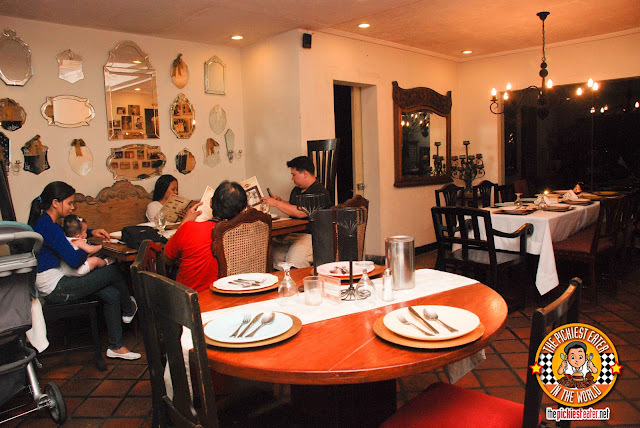 Although there were a few interesting options to dine at there, I decided Rina and I would visit it another day because we had our heart set on Pamana,which is conveniently located along Aguinaldo Highway. Pamana is a sister company of the Barrio Fiesta Group, that is run by a family that obviously knows a great deal about cooking a fantastic meal. 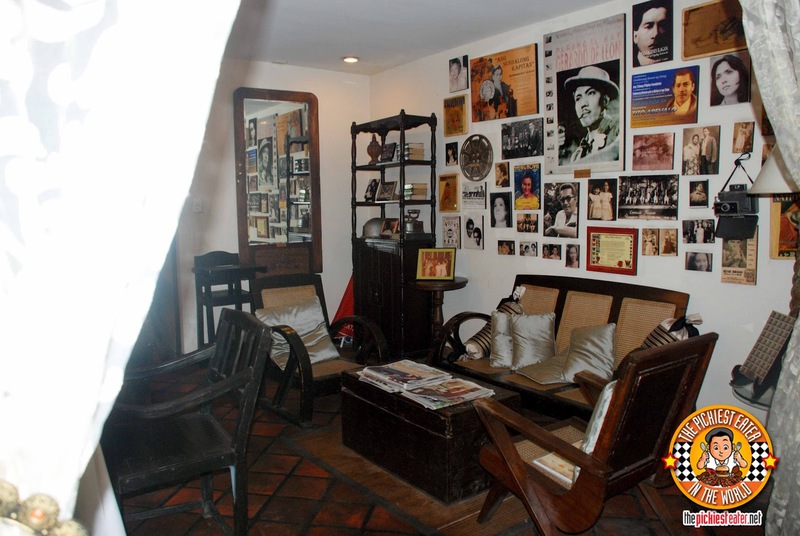 Recipes passed down from generation to generation, and collected to form the foundation of Pamana's menu. 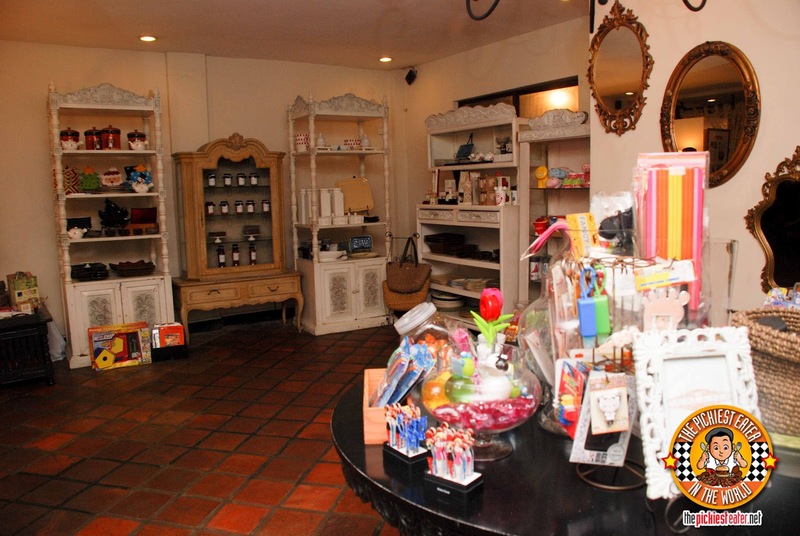 Walking into Pamana, is like walking into not so much a restaurant, but the Ongpauco's home (the family that owns it). 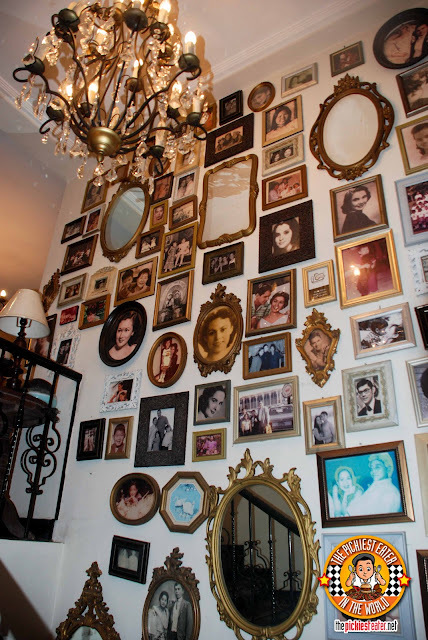 Tables and chairs looked like a hodgepodge of antique heirlooms that are brought together in an ancestral home to form a living room or a dining room. Though the furniture doesn't always match, you can't help but feel it capture the essence of family and home. Picture frames are scattered all over the walls to give you a better understanding how the legacy of food in this family runs deep. But does the food taste good? Well there was only one way to find out! The menu consisted of some innovative twists on Filipino dishes (including a Sizzling Balut Dish), but everyone decided to stick to the basics. 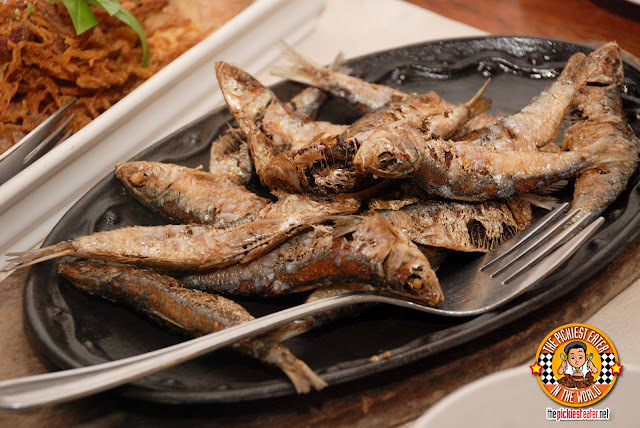 Just like Bulalo, another dish synonymous with Tagaytay is the Crispy Tawilis, so Chaikka and Rina didn't hesitate to order Taal's Spicy Tawilis (P220) as their appetizer. I have an eerie feeling Rina thought she was ordering "Tuyo" or something, because she was looking for it to be a lot saltier. She did enjoy it, however they seemed to have given us the plain variant instead of the spicy one by mistake, because there didn't seem to be any heat in it at all. I ordered Ama Grace's Chinese Sausage Rice, which was a bit different than what I was expecting. I thought it would look like sort of like a Yang Chow or something, but it came out closer to a rice topping meal than anything else. 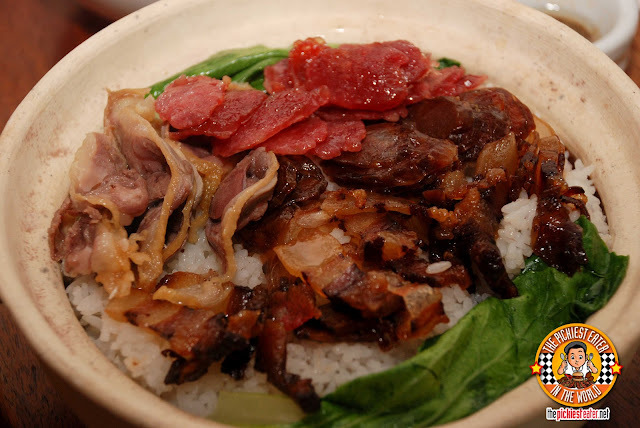 The bowl of steaming white rice is topped with Chinese Sausage, Pork Belly and liver sausage, and some sort of pale looking asado that I didn't care for very much. Everything else had a tinge of sweetness that worked together beautifully except that asado looking thing, which instead had a pungent flavor to it that I didn't like. 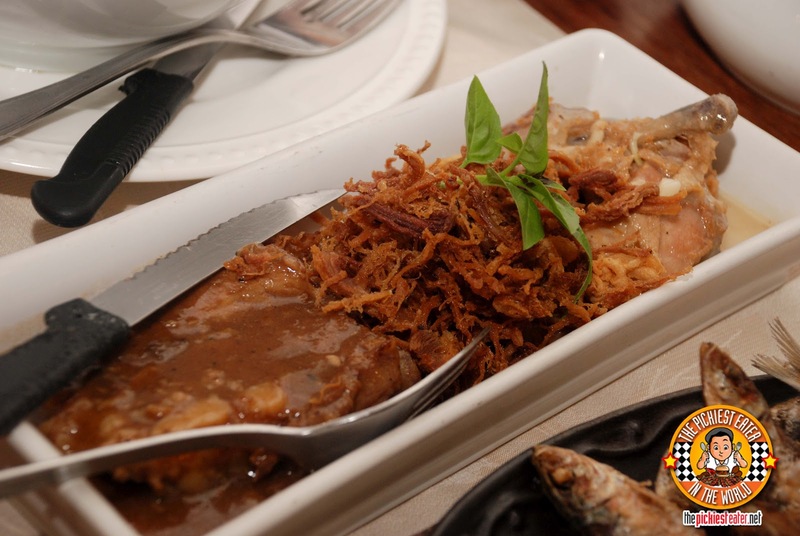 The Three Way Adobo (P295) gave Pamana a chance to showcase three different styles of cooking the classic Filipino dish. The native adobo spareribs had a gentle touch of sweetness to it, and I liked the tenderness of the meat, and the nice lining of fat. Since Pamana is in the same family as "World Topps" it came to no surprise that i LOVED the Adobo flakes. It was crispy to the bite, and it still managed to capture the flavor of the meat, without tasting burnt. The Chicken Adobong Puti had nice acid to it without being too overwhelming. I was very pleased that they gave us all dark meat parts, however I found my chicken thigh to be a tad tough and chewy. Other than that, the flavor was spot on. Chaikka ordered the Binagoongang Bagnet (P365). What I liked about this was that it wasn't drenched in Bagoong (Shrimp Paste), leaving every inch of the meat covered in it like the Pork Binagoongan I've had in the past (I do eat Binagoongang Baboy, believe it or not.. for as long as it has a lot of fat hehe). Instead, they created a small pool of bagoong on the plate, and gently placed the glorious piece of Bagnet on it. 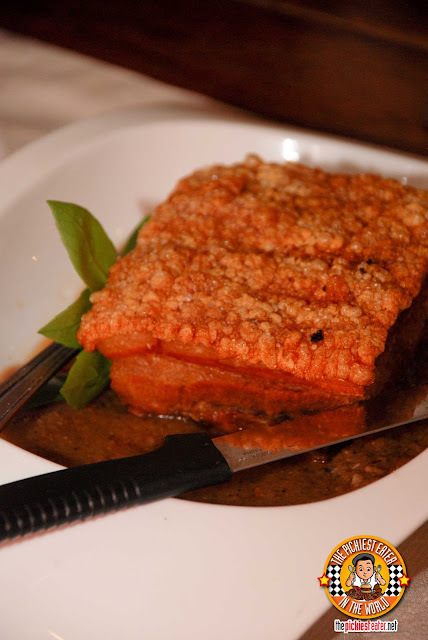 The Bagnet was deep fried to a perfect golden color, with the meat and skin being crunchy to the bite, whilst keeping the softness of the fat intact. The Bagoong they used was a little sweet, and a great companion to bring out the flavor of the pork. Words cannot express the happiness pasted on the face of Daddy Cool when the waiter brought in his Bulalo. The bone that was sticking out of the soup was so huge, one would think it was something out of the "Flintstones"! (Dinosaur Bulalo sounds kinda gross though) The soup had a hearty, meaty flavor to it. The meat itself was a joy to eat, but a little patis (fish sauce) brought the flavor out more. Daddy Cool couldn't get enough of the tendon (litid)! He just tore through it like there was no tomorrow, and luckily, this Bulalo had it in abundance! The veggies were... well.. there were veggies. 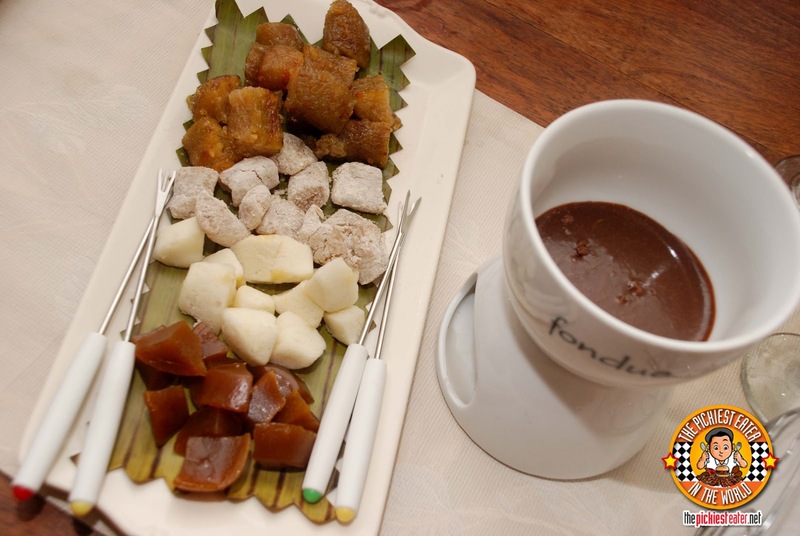 With Rina and Chaikka still high on their first Fondue experience at Eleven Tables, they decided to order Batangas' Pinoy Fondue (P265), which is a small platter of sweet native delicacies such as Puto, suman and kutsinta, served with a hot chocolate dip. Because of the presence of the word "Batangas" in it, I was expecting the chocolate to be dark and bitter, which I'm not a big fan of, but I was pleasantly surprised to discover it wasn't. It was actually closer to creamy milk chocolate, but restrained from being overly sweet by a light touch of bitter chocolate that balanced everything out. Paired with the puto, and this was an amazing way to cap off an amazing meal. 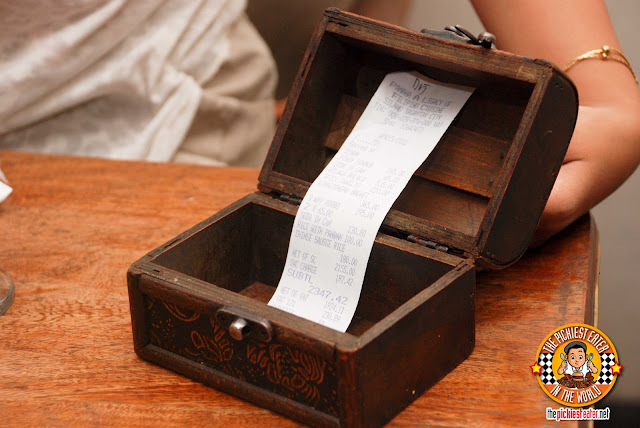 Rina found it adorable how Pamana gives you your bill in an adorable antique looking wooden box! The food was pretty fantastic, and there were so much more items in the menu I'm dying to try, such as the Roasted Pork Belly and the Ribeye Bistek Salpicao. The service was also commendable, although I was a bit saddened that they couldn't offer us the table at the fresh air balcony because it had already been reserved. The waiter said that that the one that reserved asked for the table to be reserved for 8pm. I joked the waiter that the group wasn't going to arrive anyway, so he might as well give us the table. Naturally he just laughed. We left at 9pm and the group still didn't arrive. The waiter was apologetic when I pointed out to him that we could've used that table and we would have been gone by the time they arrived. I guess either they don't have a 15 minute waiting period or it was a VIP that had the table reserved. It was shame too, because the open dining area on top was closed as well. 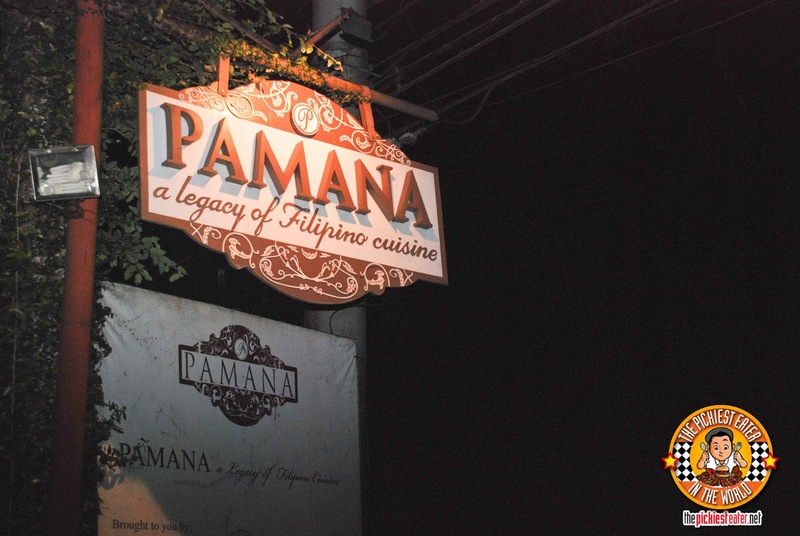 Nonetheless, it was an enjoyable dining experience at Pamana, and the perfect place to take your family! I wonder how the kutsinta (which I love) tastes like when dipped in chocolate! I haven't been to Tagaytay for a loooooong time. I hope to be back soon and try this resto. How much was your total bill? For everything we ordered plus soft drinks, it cost us P2,347.42! Yeah she was getting sleepy na hehe..
oh i like pinoy food. guess we should try this!! No promises that they'll be some left when it gets to you, Midge!